The third diagram David Antrobus used to describe the vision he received in December of 1992 is re-created and shown here. Chapters 12 and 17 of the book of Revelation speaks of ‘two women”, “two mothers”, and “two cities”, making up what was of God. From the time of the early Church she has had two streams flowing together in her midst, because John refers to the spirits of antichrist going out from among them. (1 John 2:18-19) The spirit of religion has always plagued mankind, and had always sought to walk with those who were truly spiritual. This is the image where the two are perfectly superimposed, one on the other as in the upper part of the diagram. 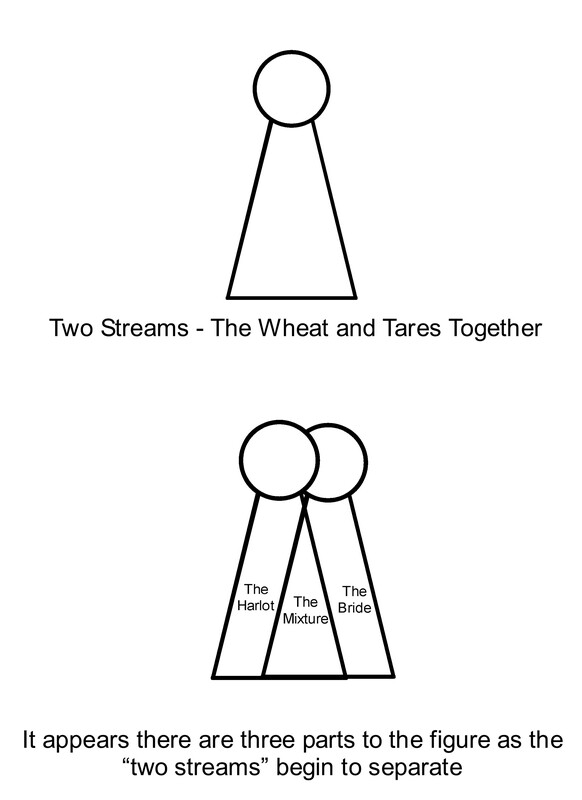 We can see the separation of the “tares” from the “wheat”, however, as the two streams have begun to move apart. This explains why there seems to be three streams, as shown in the lower part of the diagram. They are the “harlot” (those who are not true believers), the mixture of “harlot” and “Bride” (the tares and wheat still mixed together), and the “Bride” (true believers) by herself. This separation has been taking place for some time now and will continue to do so as we see the “One World Church” come into being – moving away from the Truth more and more.